Running will always be my first passion. I started this blog as a way to express my love for this sport and although it has somewhat evolved into many other things, running is and will still be an essential part of this web diary. Having said this, I am absolutely thrilled to be joining one of the events that culminates the must anticipated Run United series. For details on this event, please see below. I suggest you register early as this event sells faaaast… See you there! 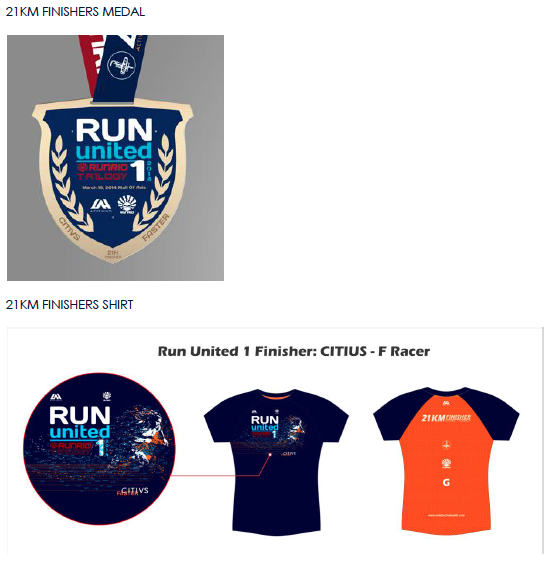 2014 Run United 1 will be held on March 16, 2014 with 500m, 5k, 10k, and 21k race categories. All categories will have a start and finish at the SM Mall of Asia. Online registration will start January 31, 2014 at http://www.runrio.com. You may purchase the prepaid cards at the following stores: from 12:00NN to 8:00PM Monday to Sunday starting February 8, 2014. For in-store registrants: singlet will be given upon registration, sizes will be on a first-come, firstserved basis. Singlet and finishers shirt sizes will be available for fitting.  Registration is on a first-come, first served basis, and may end earlier than the announced deadline. Race slots may run out before March 9, 2014.  Runners who buy prepaid cards at our stores will receive their singlet upon purchase. Runners must collect the rest of their race kit (race bib and Active Health items) at Race Kit Claiming on the following dates.  Singlet and finisher’s shirt size availability will be on first-come, first-served basis.  Singlet and finishers shirt sample sizes will be available for fitting at the registration centers.  A Valid ID must be presented at Race Kit Claiming. Those claiming race kits for others must bring authorization letters.  D-Tag will be provided to every participant to get the runner’s accurate time result and must be surrendered to claim the finisher’s item after the race.  No BIB, No D-TAG, NO RACE.  Race results will be available within three (3) days after the race at the following websites:www.unilabactivehealth.com and http://www.runrio.com.  Mondays to Fridays, 9am to 5pm only, except holidays. You can register online for 2014 RUN UNITED 1 from January 31 to March 9, 2014. 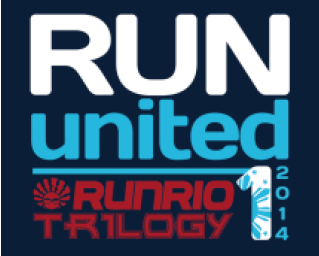 Log on to http://www.runrio.com and click on the Run United logo to be redirected to the registration page. What if I don’t have a credit card to register online? You may buy your Run United 1 Prepaid Card at Riovana branches and selected Toby’s branches starting February 8, 2014. These prepaid cards have a unique code, which you feed into the online registration form to complete your registration. If you lose the unused card, you will need to buy another prepaid card to register. The lost or misplaced cards will not be replaced. What if I buy the prepaid card and don’t register online? Your registration will be incomplete and you will not be able to join the race. You must use your prepaid card to register on or before March 9, 2014. Can I fill out a form at the store instead of registering online? No, our entire registration process is online. Runners who will purchase pre-paid cards in Riovana can already register online using the available computers at the store. What if I lose my Internet connection while registering? When you come back to the registration page and enter your email id, the system will find your form and you can continue filling it out. Where can I buy the prepaid cards? Can I buy more than one prepaid card? Yes. You can buy as many as you like for yourself and your friends and family. However, one prepaid card can be used only for one registrant. Upon successful registration, the registration confirmation slip will appear on the screen available for print. An email will also be sent to the email address that you provide with your registration confirmation slip. Race slots may be sold-out before the announced deadline (March 9, 2014). When this happens, we shall stop selling prepaid cards and close online registration. After I have successfully registered for the event, can I change my event category? No. Registration is non-transferable and non-refundable. Yes. However, please note our withdrawal policy. Withdrawal Policy Participants who chose not to take part in the event after having registered can choose to withdraw. However, please note that there will not be any registration fee refund. Race slots are also strictly non-transferable. Yes, you may email your changes to feedback@runrio.com. However, please note that changes in your information are limited to typographical errors and change in address and contact numbers only. What should I do if I didn’t get my confirmation email? If a confirmation email is not received within 24 hours, you may email us at feedback@runrio.com and we will send your confirmation email to your specified email address. What are the available registration payment modes? Is the online registration system secure? Yes. We use a security system consistent with the banking industry standards of the Philippines. How do I get my singlet if I paid online via credit card? Those who pay via credit card shall be allowed to select their singlet size online. You will receive your singlet during Race Kit Collection together with the rest of your race kit. No deliveries shall be made. Important: Please bring your ID and Confirmation Slip to collect your race pack. For those who are unable to personally collect their Race Kit, please have a representative pick it up on your behalf. Your representative must have a letter of authorization from you. Your representative must show this letter along with a copy of your Confirmation Slip. What should I present to claim my race kit? Aside from a print out of your confirmation slip, you should present a valid ID. Is it mandatory to pick up my race kit? Yes. As the race kit includes your race bib as well as your timing tag (D-Tag). Without this, you will not be able to join the race. Strictly no collecting of race packs on race day. Yes, you can have someone else pick up your race pack on your behalf should you not be able to make it. However, you’ll need to issue that person a letter of authorization and a copy of your valid ID (school, employee, SSS, TIN, Driver’s License, Passport, Postal, GSIS, Voter’s ID). Is it possible to collect my race kit on race day? No. Runners who arrive on race day without their race kit will not be allowed to join the race. No bib, no D-tag, no race. No. Should you not be able to make it yourself, kindly authorize somebody else to pick it up on your behalf. The starting line for ALL categories shall be along Seaside Boulevard at the Mall of Asia grounds. The 21k, 10k and 5k participants’ starting line is along Seaside Blvd. North bound (near Block 16) in Mall of Asia. The 500m dash participants’ starting line is along Seaside Blvd. North bound (near Block 16) in Mall of Asia. The 500m dash participants’ wrist tags are provided upon registration. The parent and child participant must put on their corresponding wrist tags complete with contact details on race day. NO tag, NO race. Baggage deposit facilities will be made available for you. We recommend that you arrive earlier than the gun time to deposit your bags to avoid delays. You must deposit your baggage/s at designated baggage deposit tents for your particular distance. While maximum care and security will be enforced, the organizers will not be responsible for any loss or damaged items or delays in retrieving bags. We strongly advise that you do not to leave any valuables in your bags. The race organizer and any of its sponsors will not be held liable for any loss or damage to your personal items. Is it necessary to wear the D-tag timing device? Yes, as this is will be used to measure your accurate race results and split times. Do I need to return the D-Tag upon completing the Race? Yes, we will collect the D-tag at the Finishers Area. No D-tag, No Finishers Items. What happens if I am injured along the Race route? First Aid stations can be found along the race route as well. You may also alert Route Marshals or patrolling Paramedics regarding your injury. All categories will have 2 wave starts with 5 minutes intervals. ALL CATEGORIES have a start cut-off time of 15 minutes after the last wave start. Runners who arrive later than 15 minutes after gunstart will no longer be allowed to start the race for safety and security reasons. In order to ensure timely re-opening of roads to normal traffic and help ensure your safety, the race organizer will deploy a vehicle to pickup all remaining runners on the race route starting at 7:30am. By this time, all participants are encouraged to stop running and board the official vehicle. They are automatically disqualified and will be taken directly to the finish venue. 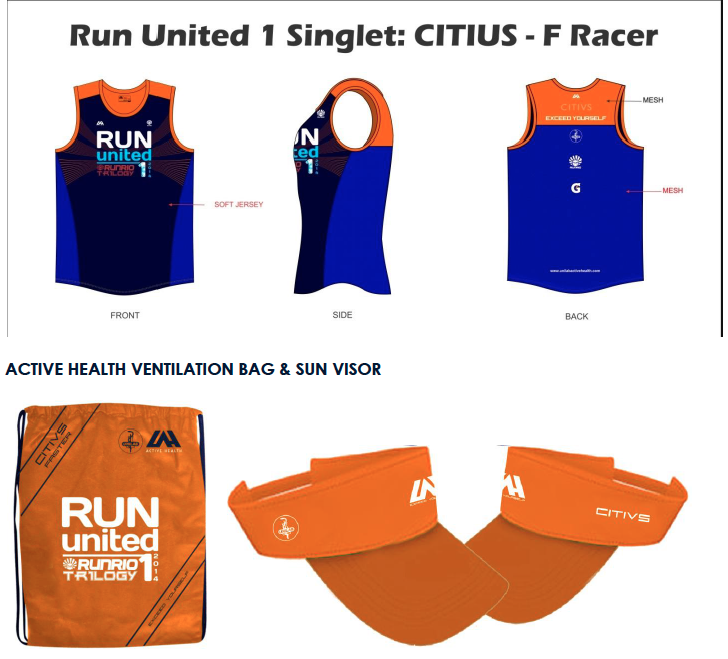 What if the 2014Run United 1 race singlet does not fit me? Can I still participate in the race? Can I exchange it for a different size? Yes you may still participate in the race. Singlet can also be exchanged within seven (7) days after date of purchase. Singlet can be exchanged provided it is in new and original condition. Singlet sizes are also subject to availability. What drinks will be available for us? You can refresh yourself with Gatorade and water at the hydration stations. Are walkers permitted to participate in Run United 1? Yes. But should you wish to walk during the race, kindly keep to the right side of the route to allow faster competitors to pass. Can I bring my pet dog with me for the race? No. For the safety of the other runners, pets are strictly not allowed at the event site. Will wheelchairs, bikes, skates or strollers be allowed on the race route? No. Instruments with built-in wheels other than those on the official vehicles will not be allowed on the race course. Will my family and friends be allowed to come support me at the Event? Yes, supporters are most welcome to cheer you on anywhere along the entire race route. Please remind them though that they should be mindful not to block the path/route that the participants run in. 9) RACE AWARDS What prizes will be awarded for each category? Where and when will the Awards Presentation Ceremony be held? The Awards Ceremony will be held at the Unilab Active Health Village on the day of the race. Will there be road closures and parking facilities at the start and finish line? Yes, there will be road closures. Parts of the race route on the event day will be closed to traffic. Please refer to the official road advisory in the official race guide for specific road closure timings.